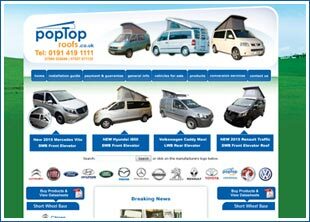 PopTop roofs are one of the largest suppliers of T5 and T6 campervan roofs in the UK and our roofs are fitted to hundreds of campervans annually. Our latest range of Super High Lift Low Profile campervan roofs, Slimline campervan roofs and California Lo campervan roofs, that we are calling the Streamline range, have been developed due to increasing customer demand for lower profile and higher lifting campervan roofs. 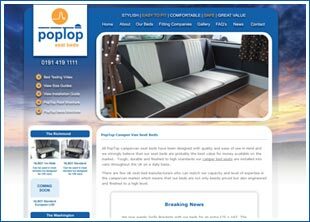 Quality of manufacturer is still a key requirement for our customers and with this in mind we have developed our low profile campervan roof range to be not only visually appealing but also robust and functional. 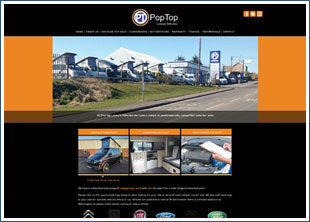 Note that the details below relate directly to our Super High Lift, Low Profile Campervan Roof. You are currently viewing details for the Streamline Super High Lift, Low Profile SWB | View Streamline Super High Lift, Low Profile LWB. 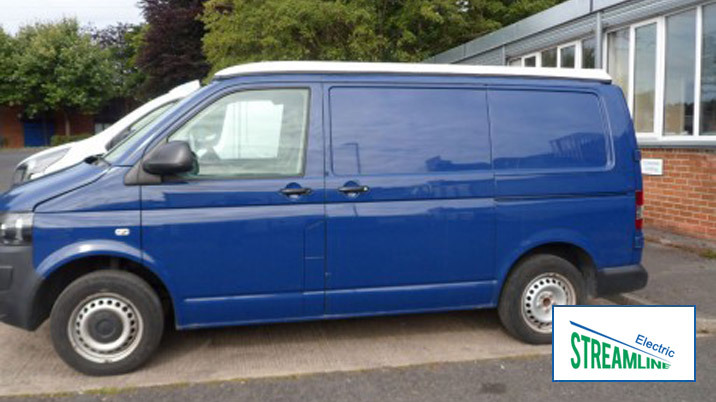 Our Super High Lift, Low Profile campervan roof is hardly visible unless you know what you are looking for and it closely matches the shape of your van ensuring minimal wind resistance while maintaining the original profile of the vehicle. There is a slight increase in the roof profile which ensures that head room within the vehicle is maintained when your low profile roof is retracted. Maximising space within your vehicle is where our Streamline Super High Lift, Low Profile campervan roof really excels itself. Maximum headroom when closed and ample standing room when extended. If your taller than 6ft 2in then you will have to duck your head a little at the back of the van however most people will have more than enough head room at both ends of the van. 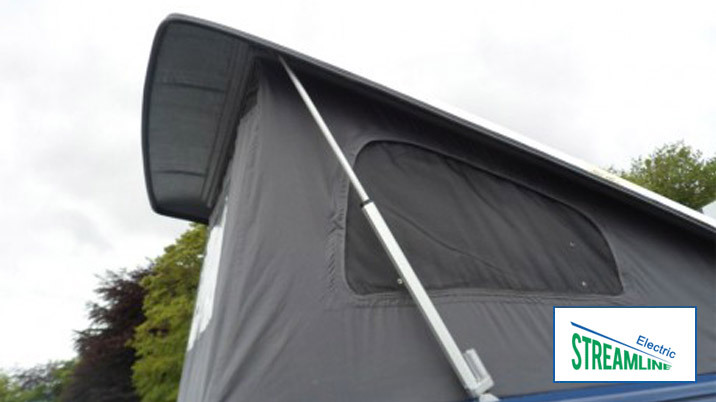 To maximise the tent space the hinges and gas struts are positioned inside the tent giving you noticable extra room when compared with our competition. The internal width of the tent is 1.2 meters. 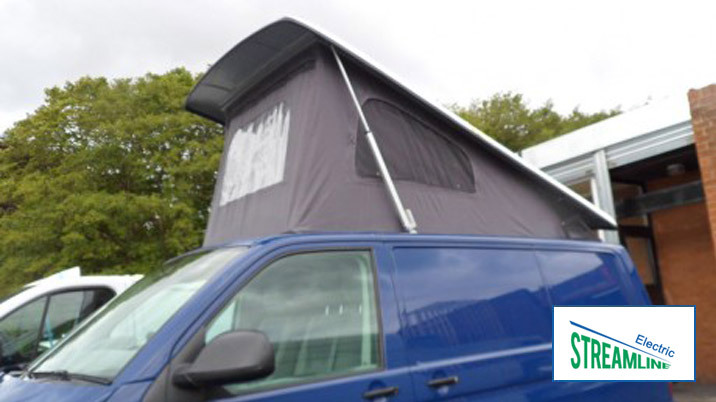 All our Super High Lift, Low Profile campervan roofs are manufactured with quality and durability in mind however to give you peace of mind we are happy to offer a five year warranty on our roof shell and fitting hardware. You don’t need a degree in Engineering to put our campervan roof system together!. 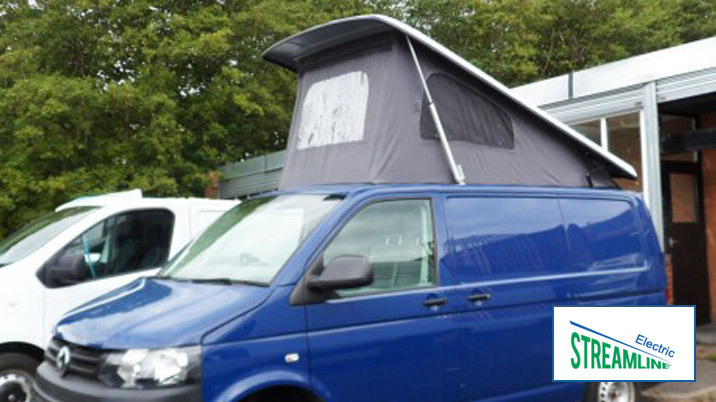 Can be fitted far easier than roofs from other campervan roof manufacturers and we can deliver with a minimal lead time. Our campervan roof comes in Grey as standard however you can choose from a range of colours and alternative canvasses for an additional £150 + Vat. On our Super High Lift, Low Profile roof the gas struts and hinges are positioned inside the tent which maximises the space available to you at the front of the tented area. Our unique Super low roof design also means that there is no need for an internal rainwater drainage system.